Binge drinking is drinking a lot of alcohol in a short space of time in order to get drunk. Because height and weight and other physical factors play a part it’s difficult to say exactly how many units constitute a binge. According to the Office of National Statistics (ONS), consuming more than six units of alcohol for women and eight units for men in a single session is considered a binge. And the units can quickly add up - so keep an eye on your serving size and choice of drink! Our free DrinkCoach app can help you do just that. ABOVE: What eight units looks like…. For men eight units of alcohol in a single session is considered a binge. Eight units is equivalent to drinking: Three large glasses of (250ml) of 12% ABV wine or three pints of 5% ABV beer or cider or eight shots 40% proof clear spirits. ABOVE: What six units looks like…. For women six units of alcohol in a single session is considered a binge. Six units is equivalent to drinking: Two large glasses of (250ml) of 12% ABV wine or two pints of 5% ABV beer or cider or six shots 40% proof clear spirits. Is your health still affected if you spread out your drinks? Consuming excessive amounts of alcohol over a short time or ‘bingeing’ means that your body simply can’t process the alcohol in your body quickly enough and this results in a high Blood Alcohol Concentration (BAC). High BAC levels are associated with increased risk of injury through accidents and poor judgment, as well as other health related issues including abnormal heart rhythms, high blood pressure, sudden death and increased risk of STI. And don’t forget those late night trips to the kebab shop or fast food outlet – all those extra calories on top of the alcohol can have a big impact on your health. On average it takes a healthy liver about an hour to break down one unit of alcohol. Bear in mind individual differences such as age, gender, height, weight, and health conditions can impact on this processing time. Spreading your drinks over several hours (and over meals) may have a lower impact on your BAC, but your health will still be affected. Read about the short-term and long-term effects. Not sure if you’re binge drinking? 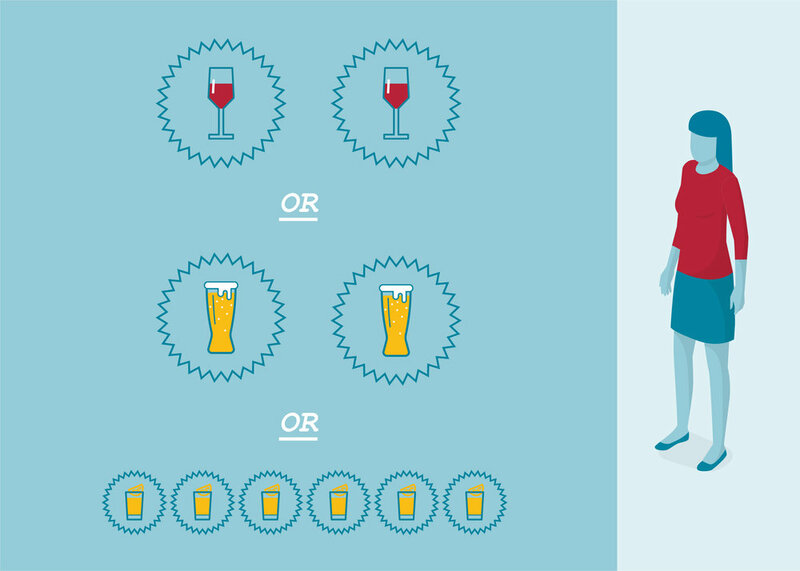 There’s an easy way to find out… Take the alcohol test to see how much you are drinking on an average night. You can also download our drink tracker app to track your units on the go or speak to one of our trained alcohol specialists via Skype – book your appointment now.